It’s an election year for Dominicans, and it’s nearly impossible to go anywhere in the capital, or really anywhere in the country without being visually assaulted by yet another political slogan or image. My favorite form of political advertising has become the fleet of converted commercial trucks with stacks of concert speakers blaring out political dance music at 1,000 of decibels. Many are hoping that with the actual elections being next month, the fervent political activity will die down, but others tell me, that it’ll never cool down, it just means half the population will still be angry, and wait another four years before the next beacon of hope emerges. Politics, to me, has always seemed like a sport where there’s really only two rivalries. Fans wear the colors, check the stats on the internet, attend the events, and like to bring it up in conversation and put down the other team. Even though I consider myself willing and able to talk about anything, I’ve always tried to stay out of that world. Maybe it’s because I don’t like the banter, or that I’m slightly pessimistic that anything will really change for the average citizen apart from real and dedicated involvement in community and local government. Still, my apathy hasn’t precluded me from taking up an opportunity when it arises. “Llego Papa!” is the slogan of the PLD political party. 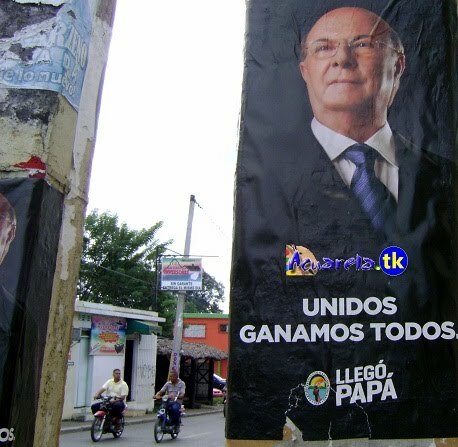 It means “Papa has arrived!” and it’s a reference to former president Hipólito Mejía who was president from 2000 to 2004, a man regarded by many as having a father-like style to leadership. During that time, the Dominican economy experienced one of it’s worst economic downturns in recent history with inflation going from 1 Dollar to 16 Pesos, to 1 Dollar to 60 pesos. The reality was that millions of Dominicans took substantial hits to their savings and investments. Depending on which side you’re on, this was either the result of the crash of global economy after Sept. 11 or the government’s mismanagement. Currently, the exchange rate and is 1 Dollar to 39 pesos, and Dominicans will say that the government is still corrupt. “I want to go see him!” I said with excitement. See, given the opportunity to meet any US president or world leader I would do it, but in this case, we were running late, and all I wanted was to check to see if Papa was in the building. 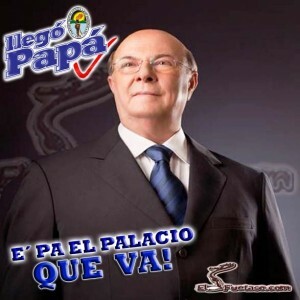 Hipólito (Papa), in fact was sitting in a private room doing an interview with a TV station. I stood there and marveled at this celebrity, a glimpse of a fame, and quietly walked out, content with a smile on my face. Pedro, turns out, was talking to the head of Hipólito’s security, ex-General Carlos Díaz Morfa, and said, “This American really really wants to meet Hipólito.” (I dunno if I’d say “really” I mean, we were running late, and I was already nervous because I snuck up to the window to take a look. Morfa spoke to me in English and asked me what I do in the country. I explained to him that I was a volunteer with a Christian microfinance organization focused on alleviating poverty throughout the country. I turn around and motion to Pedro, I’m about to head into the private meeting room. I walk past a lot of security: guys with firearms at their side or their belt, walkie talkies and security headsets with the cables in their ear. 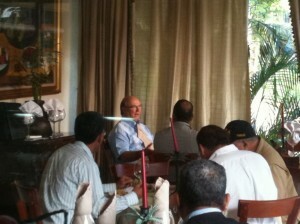 Morfa pulls up a chair and sets it about three feet from Hipólito. The man sitting next to Hipólito stares at me without any emotion and waits for me to break my gaze; I’m pretty sure this is a security check. I set down my backpack. Hipolito had just finished his breakfast, so he sets down his napkin turns to me and says in English, “So where are you from?” offering a smile. I answer him that I’m from Richmond, VA which is pretty close to Washington D.C.
At this point, I’m not sure what I should say, but I’m never one who lacks words or ready small talk fodder, so I feel like I should follow-up with a bit of local trivia about Richmond, namely that Steven Speilberg just finished filming a movie about Abraham Lincoln there. I’m impressed that even in my nervous chatter, I manage to accurately speak of Richmond’s recent and ongoing fame, all the while in Spanish. I answer him in Spanish explaining that I volunteer for a Christian organization called Esperanza and we help people in poverty by making small loans enabling them to start small business. Both he and his right hand man are impressed this time, and he makes the comment in Spanish “Well, he talks with a Dominican accent, not so much of a gringo accent does he? 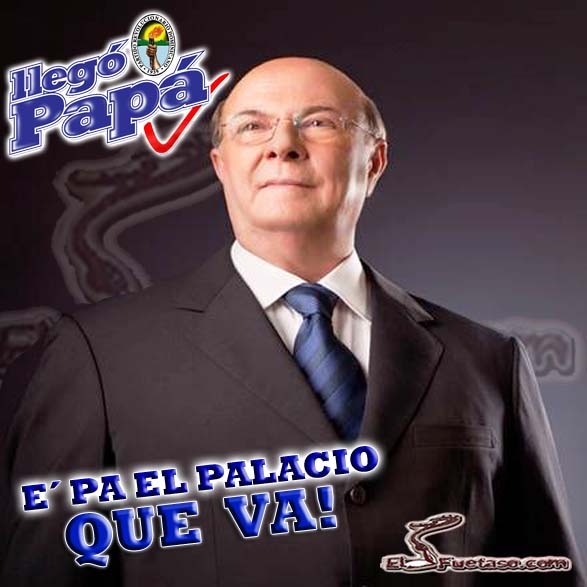 I just got complimented by a former Dominican president on my Spanish. I think to myself that I have finally arrived . . .
Pedro, outside of the breakfast room, has finished his phone call and made his way past security. He comes up taps me up on the shoulder and reminds me, “We need to get a picture.” That’s right! I remember. I’m so nervous and jittery, at this point, I could probably be convinced of anything. 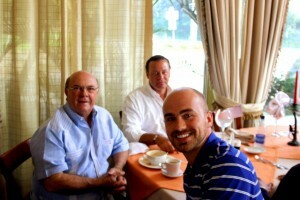 I introduce Pedro, the Microfinance Director, to the former president, and they shake hands. The obvious contrast of a volunteer introducing the director to a former president makes me laugh. I ask Hipólito if we can take a picture and he agrees. I reach for my backpack next to me and think that all of his security are probably drawing their weapons and aiming at me. I smile and just proceed slowly. I certainly don’t want a scuffle this early in the day. Finally, the pictures snaps, and it’s clear that Hipolito and Co. have to go. I shake his hand, and he adds that it was a pleasure to meet us and that we should keep on doing good work here in the country. I tell him good luck and God Bless! We walk past the security again as Hipólito does a few more meet and greets. Morfa is waiting for us outside. Obviously, I’m elated. Meeting a former president was a surreal experience, and even though I was incredibly nervous, I know it was success. Morfa starts joking with me about being star-struck, and I continue on that streak just thanking Morfa for the opportunity to meet Hipolito. I get introduced to a few more people of the campaign, and then Pedro and I make our way back to the car. This entry was posted in Dominican Republic on April 17, 2012 by Aaron.